Torino of Italy defender, Ola Aina and Bordeaux forward, Samuel Kalu have ben ruled out of Nigeria's last African Nations Cup qualifier against Seychelles and the international friendly billed for Asaba this weekend and early next week. In their stead, the coaches led by Gernbot Rohr have called up Enyimba of Aba's Ikouwem Utin and Ndifreke Effiong of Akwa United. 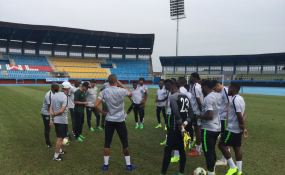 The team started converging on Asaba yesterday with Odion Ighalo, Alex Iwobi and Semi Ajayi among the first arrivals in the Super Eagles' camp. Also already in camp are goalkeepers, Francis Uzoho, Ikechukwu Ezenwa and Daniel Akpeyi, as well as Utin, Effiong and Enyimba's Valentine Ozornwafor.